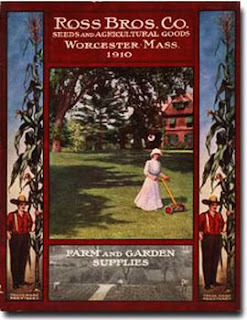 It's that time of year again when the seed catalogs come daily. Time for decisions on what to plant where, always keeping in mind the idea of crop rotation, as well as what vegetable we need and can preserve. 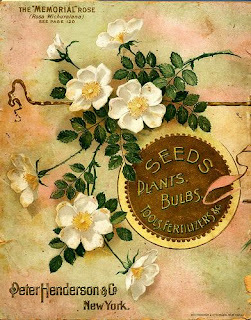 These are some of my favorite vintage catalogs. The artwork is vivid and detailed, and the prices can't be beat. 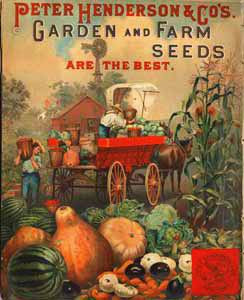 Ratekin's was a mail-order seed company started in 1884 in Shenandoah Iowa. They were the first to sell the famous Iowa seed corn. 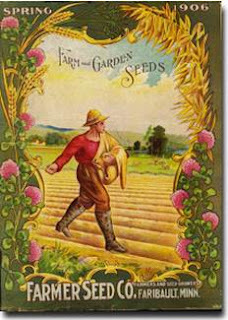 They were “the largest seed house in the West and the largest producer of seed corn in the world.” Each seed offered was accompanied by testimonials from satisfied customers. Alas, sometime before 1920, Ratekin's was out of business. Peter Henderson was a Scotsman who came to America in 1843. 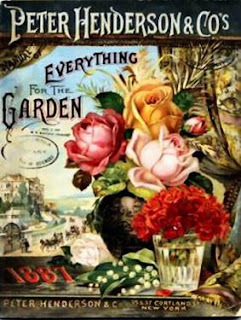 He started a truck garden in New Jersey, then expanded into floral gardening, and finally by 1890 had five acres of gardens under glass. Henderson’s contemporaries called him “the father of horticulture and ornamental gardening” in the United States. 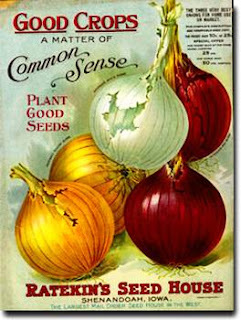 In 1871 he established a seed company called Peter Henderson & Company and was the very first to use color in a mail-order catalog. Farmer Seed Company is actually still in business in Faribault Minnesota -sortof - they are now a division of something called Plantron. 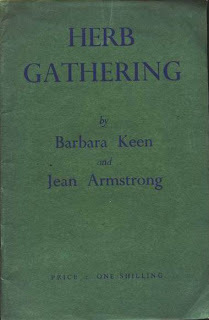 Their current catalogs are much less appealing than this 1906 edition. Ross Brothers appear to be out of business now, possibly because all that gentile lady found out it wasn't quite that easy to mow the lawn in full dress. Any woman living in a house like that would definitely not be out mowing her lawn. Or maybe that giant corn toppled over on some unsuspecting gardeners. 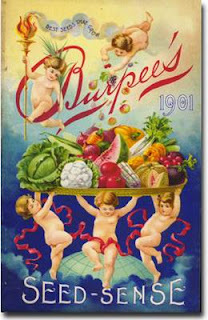 Never, ever, in all my years of gardening, have naked cherubs ever helped me carry in vegetables. Growing up in Louisiana, surrounded by Catholics, I've always been enchanted by the idea of saints. Which is sortof strange, considered my family was Southern Baptist, and pretty much had no use for saints. What's even stranger is that as an adult I'm not religious at all, and I still like the idea of saints. So naturally I lean towards having a saint in my garden (hoping he or she can undo some of the mistakes I constantly make). I always thought St. Francis was the proper saint for the basil rows, with his arms outstretched and the birds perched on his shoulders. Turned out that was because he is the patron saint of animals. But now I've discovered St. Fiacre. Who it turns out is THE saint to go to for gardening help. 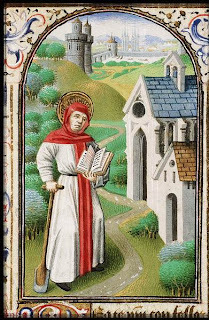 St. Fiacre was born in the 600s in Ireland in a monastery where he was educated and taught about all sorts of plants and seeds the common people would never hear of. Traveling to France, he was granted forestland to build his monastery on and plant his gardens. 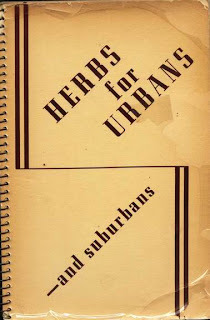 He planted so many flower and herb gardens he ran out of land. St. Firo offered Fiacre as much land as he could turn up in a day. Legend says Fiacre took his cane and drew a trench in the ground, then prayed. By the next morning, all the soil was turned. As a result of this miracle, one woman reported Fiacre to the local Bishop for using magic. But the Bishop decided it was a miracle, proclaimed Fiacre a Saint, and then turned around declared the woman a witch. (One man's miracle is another's magic). 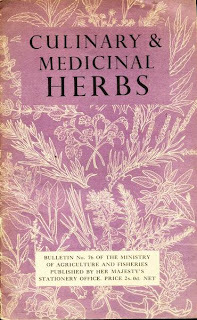 Fiacre grew amazing herbs and was know far and wide as an accomplished healer. He also had an extreme dislike of women, never allowing any women to enter his gardens or chapel. 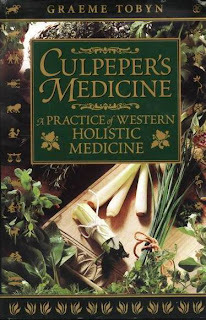 This may dull my enthusiasm for him in the long run, but at the moment I like the idea that he was a herbalist who managed to avoid being called a witch. Probably cause he was a man. At any rate, I'm in the market for a St. Fiacre statue, if he'll have me and my female garden. 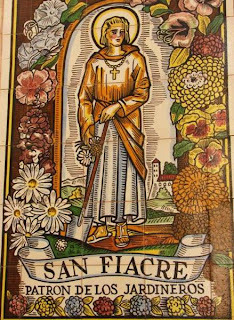 I'd like to have one by September 1st, St. Fiacre Day. Also known as the traditional Labor Day. And the date of the first publication of Mary Had A Little Lamb, but that's not really pertinent. Unless you have sheep in your garden, in which case it's a lovely connection. If you read my other relatively normal blog, 365 Days in the Moonshine Capitol of the World (yes that's where I live), you've heard about The Great Clean, Paint, Rearrange Project currently underway. 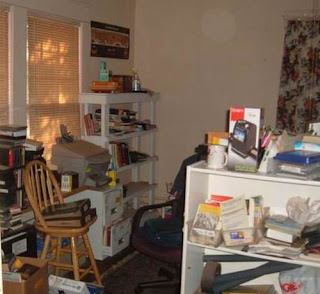 This is the "before" view of my office. When there's an "after" view, I'll post it. It'll be a bit. BUT - part of cleaning is going through endless stacks of clippings I've saved - gardening ideas, genealogy notes, recipes, remodeling projects, hard copies of emails, the list is endless. It's lovely to have many areas of interest, but it's really hard to keep the areas organized. And I won't even mention the books. I'm a bookseller by trade, but probably less than a quarter of the books in my home will ever be offered for sale. I'm an unapologetic book addict. For those icy steps -throw baking soda down in place of ice-melt chemicals or kitty litter*. Baking soda will provide traction and help the ice to melt. If it gets tracked inside, it doesn't damage the carpet or floors (just helps deodorize them). Still got icy steps or run out of baking soda? Mix a little Dawn detergent with warm water and pour it over the steps. They won't refreeze. *Our household has been a member of the "kitty litter" club since our winter days in Minnesota. Every fall, each vehicle gets 40 lbs of basic clay kitty litter tossed in the truck. It provides extra weight on icy roads, and if the car gets stuck, the litter can be thrown under the wheels for instant traction. At the end of the winter driving season, whatever's left goes to the real kitty box, killing two birds with one stone. In Minnesota we kept a bag by the back and front door to throw on the walkways. It's much less damaging to the environment than the chemical melts and works just as well. I'm saving the gardening and compost tips for this spring. I'm getting all organized so I don't lose them again. Really. I am.